A glancing header early in the second half by Ryan Holms earned Queen's Park a last-16 tie away to Celtic in the Homecoming Scottish Cup. The Spiders carried their recent good form into the match and dominated the tie, with Stevie Nicholas and Ian Watt going close in the opening period. 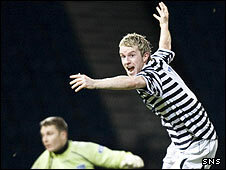 Peterhead's Michal Kula saved from Paul Cairney, then Paul Harkins pounced on a Kula spill, but David Donald cleared. Holms' winner came in the 51st minute when he dived to meet Harkins' cross. "I thought we played really well and passed the ball well and made chances. Ryan got his head onto a great ball by Paul Harkins and we deserved the win. "The longer we played we felt we were on top in the game. "It is a massive boost for this club to go to play against the Premier League champions at Celtic Park and hopefully it will motivate them for the league games coming up between now and then. "It is an opportunity for the players to play at another wonderful stadium. "We spoke before the game about the carrot of Celtic in the next round and not to get over motivated and I feel they did that and we got the result." "That was utter garbage tonight. "I'm a passionate person and was sent to the stands and I'm not proud of that. "I was angry at half-time and words were spoken. From the goalkeeper right through the team we had nothing and it is unacceptable, especially with such a big prize at stake. "The loss of the revenue a game at Celtic would have brought us is massive. It would have paid off a lot of debts and put the club on a sound footing." Queen's Park: Crawford, Ure, Douglas, Sinclair, Brough, Quinn, Holms, Gallacher, Nicholas, Harkins, Watt. Subs Not Used: Boslem, Ronald, Coakley, McGrogan, Cowie. Peterhead: Kula, Donald, Moore (Mann 57), Smith, MacDonald, McVitie, Sharp, Ross (Gunn 59), Bavidge (Kozminski 72), Anderson, McKay. Subs Not Used: Bagshaw, Jarvie.